There are 6 sections of 3 sails each, which make up the wheel. Bolts are provided. Slide the SAIL RIB (101) over the small end of the SAIL (100) until the rib fits into the rectangular notches on each side of the sail. Repeat this on all 18 sails. 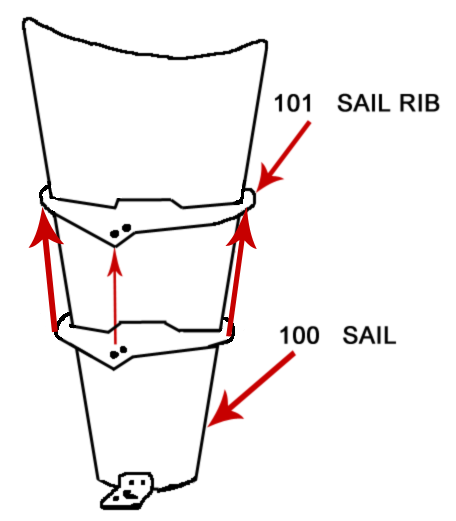 The assembly is easier if the rib is held at an angle to the sails as it slides into position. Use a flat-edged tool to bend the rib down inside the sail so the outer bands will easily slide into position. 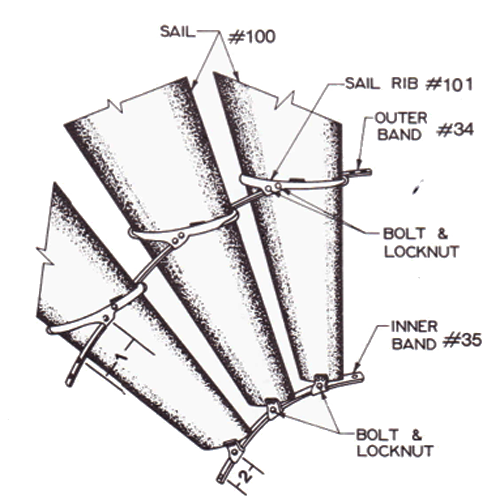 Slide 3 sails onto the outer band (34) through the slots in the sail on the inside of the rib. 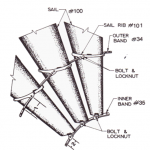 Hold the outer band with 4 holes on one end and slide the band through the back of the sails. Install bolts through the ribs on each sail. Attach the Inner Bands (35) to the sail on the inside of the tabs. Make sure the hole locations in the inner band match up the outer band (long and short). After all sections are loosely assembled, check to make sure the parts are positioned correctly and then tighten all the bolts and locknuts. Install the Wheel Arms (736) into the hub with the end having hex head nut screwing into the hub. You can use a stainless stell shim or lead washer at the hub to help position the wheel arm to line up with the other wheel arm. Screw the threads in all the way, but do not tighten. Line up the tabs on the front and back wheel arms with the hole inthe inner band, and tighten the wheel arms. To insert the bolt, you may need to use a punch and vice grips to line up the holes. If you have any questions, please call us at 530-644-3008 AFTER 6 AM Pacific time.